It’s beginning to look a lot like Christmas, doesn’t it? With the holiday parades, the lights up at Honolulu Hale and this windy, cold weather in Hawaii, it’s truly bringing in that holiday spirit! And what is the holidays if not for parties? Well, we’re fully equipped and ready to host or cater any holiday party this month! Still need to book your family and company holiday party! We have a number of different options for you ranging from small family gatherings at our Ward location, Piggy Smalls, to a complete restaurant buyout at The Pig & the Lady in Chinatown! 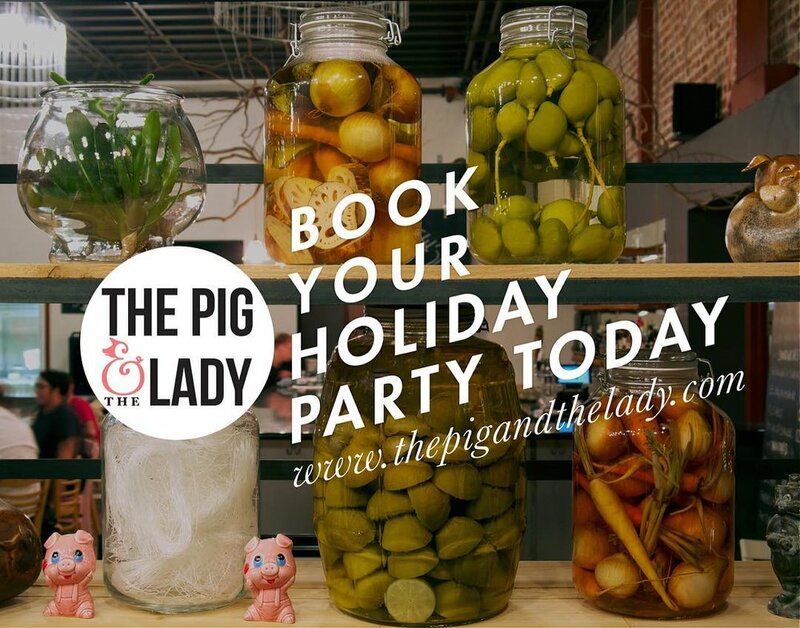 Call us at 808-585-8255 or email us now at catering@thepigandthelady.com for more information and we can customize any event to your specs and liking! As for other events, we will be back at New Wave Friday at South Shore Market this Friday, December 8! New Wave Friday is a fun family-friendly event featuring activities, shopping exclusives, food, libations, live entertainment and more, located at South Shore Market, right down the street from Piggy Smalls. This “night market” will take place from 5pm-9pm. Swing by! Do these specials not make your mouth water? Come get some at the farmers markets this week! For the full menu and schedule, head over to the Farmers Market Page.